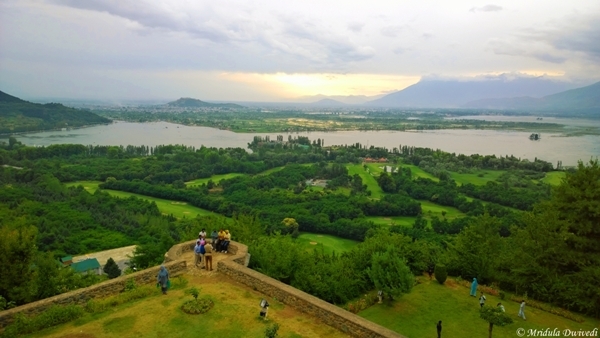 I was so excited when I got a call from the PR team handling J&K Tourism. I immediately agreed to go on the trip, I took three days leave as well. For me leaves are really truly precious because I work full time. Anyway, talking about leaves is not too engaging, so back to the Kashmir trip. 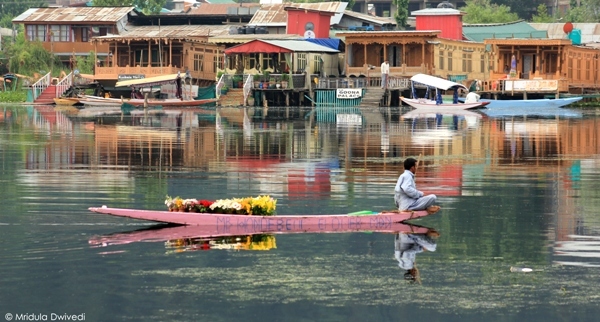 We stayed at a house boat at the Dal Lake in Srinagar for the first night. It was a unique experience. The name of the houseboat was Acropolis. It was clean though the bathroom was far from ideal. It was clean but had an antiquated and non-functional tub and to take bath you had to climb in. Other than this minor gripe the experience was quite memorable. We visited the floating vegetable market at the Dal Lake early in the morning. Originally the market might have been only for the vegetable but now with tourists around flower seller also join in. It was such a pleasure to wake up at the other side of the lake and watch the birds and life generally around the lake. Srinagar is full of Mughal gardens but on this trip I could visit only one. Pari Mahal is a seven terraced garden built by king Dara Shikoh somewhere in 1600s. It is a beautiful garden but more than that it has stunning view of the city. It is a bit outside the city, with narrow roads leading to it. I could have sat there for the whole day and looked at the view. No, before you say you envy me, let me tell you I could not take a ride. 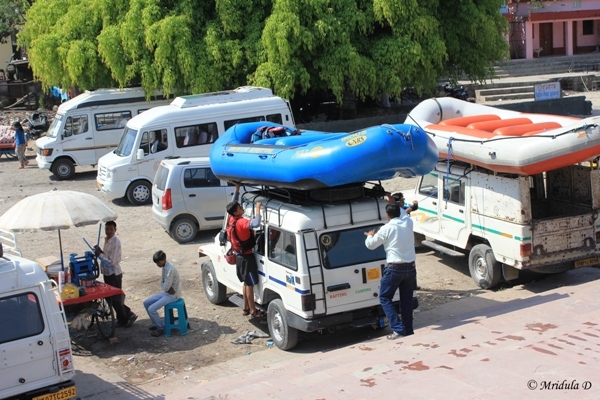 Kashmir is trying to develop adventure tourism. 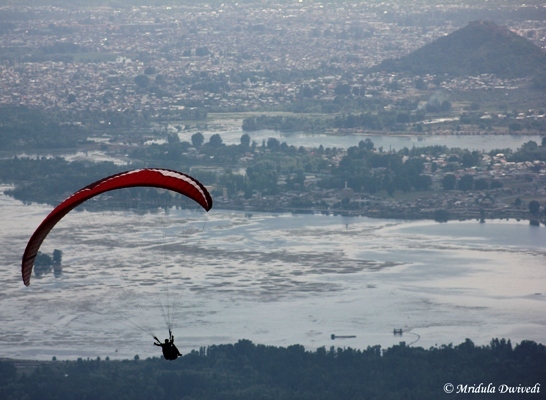 Paragliding is one of the activities. It is happening on a hillock at the Asthan Marg. For us it was difficult to locate the place. As of now one has to trek 1.5 kilometers to reach the spot. It was fun for me but it would have been even more fun it I could have taken the flight! Anyway, there is always a next time! What a view we got even from the hillock. 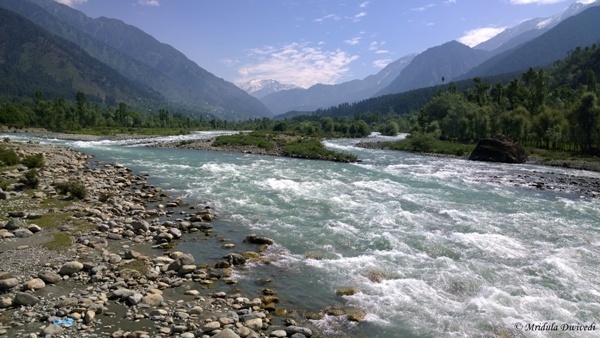 What I could do was rafting on the Lidder River at Pahalgam. It was a short stretch of 2KM but that was enough for me. The water was so, so cold that I would yell and scream (no, really I did that) every time I got drenched. I can only shudder when I think what would have happened if I got thrown-in. Thankfully it never happened. Finally, it is time to talk a bit about food. You are better off if you are a non-vegetarian as there are many local dishes you can try. 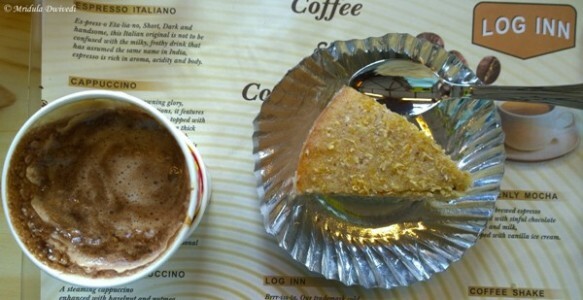 I can only talk about this excellent lemon cake and coffee at Cafe Log Inn. Read it carefully, it is not login and password, it log as in wood Inn! More on these snapshots in later posts. 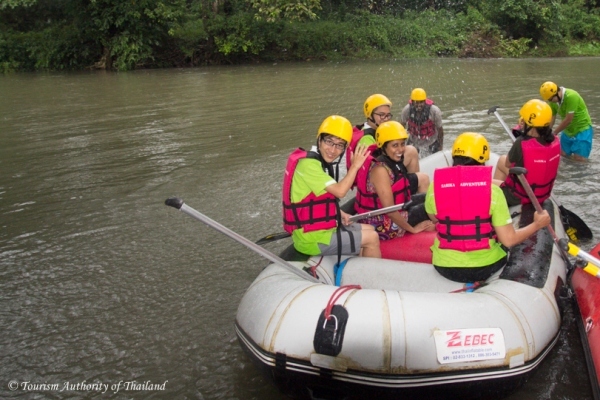 One of the fun things we did in Thailand was rafting at Nakhon Nayok. 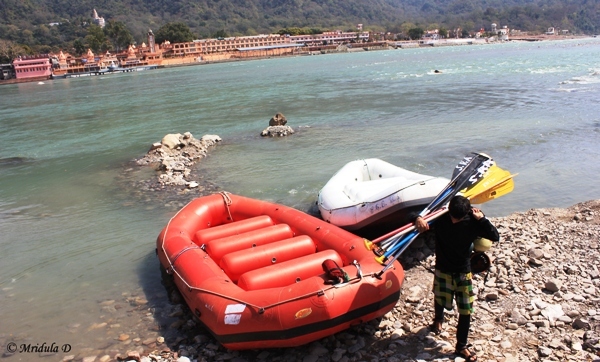 I have been on rafting trips before in India so I knew what to expect. 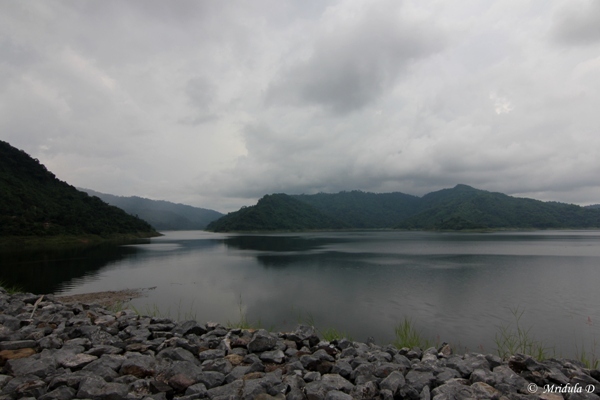 There is a dam on the Nahon Nayok River which was the idea of the current King of Thailand known as Rama IX. The King of Thailand is highly revered in the nation. I saw many pictures of the king on display and he holds a camera in so many of them! We stopped at a bridge to look at the dam and the surrounding areas. The view of the Nakhon Nayok river is beautiful and later in the evening we were going to raft along it. We started near a bridge late in the evening, there were 6 of us in the raft other than the expert. If you have rafted in the Ganges you will find the Nakhon Nayok River milder. 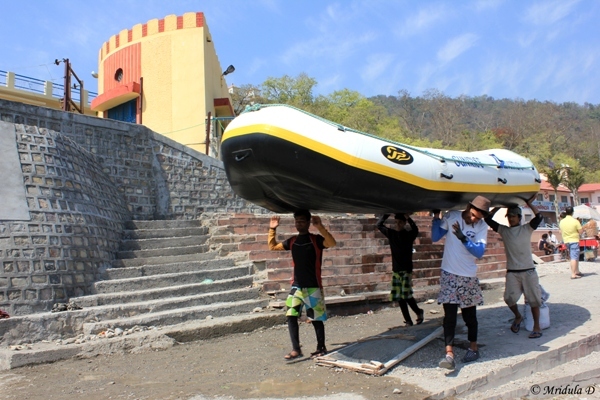 In Rishikesh both the times there was a dry bag on the raft so that I could put my camera in it. On calm stretches they would let us take it out and do photography. Not so in Nakhon Nayok, they had a dry bag but not in the raft. So I had no camera while we went rafting and for sure I had withdrawal symptoms! Rafting was a lot of fun. All of us took turns to sit at the front of the raft. That is where you get drenched most. But unlike the Ganges there was no one who got thrown out in the water. There was a mild rain as well which made the experience even better. The worst we did on this trip was, we would turn the direction of the raft. The expert was the last person in the raft and when we would hit the mild currents we would make him become the first, the raft would turn 180 degree. The expert was able to correct the position again quite easily. We did this many times! 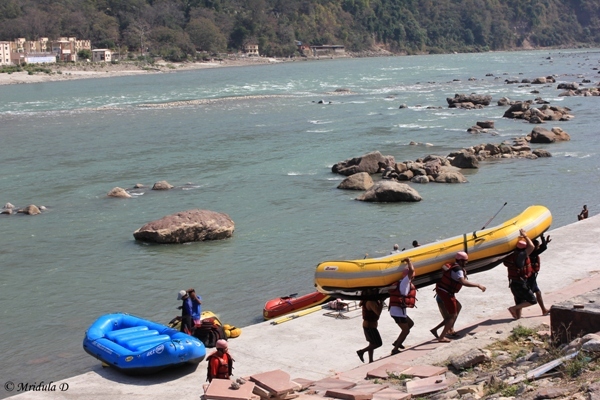 When we reached at the end point for rafting there was another activity waiting for us. From an elevated platform we had an option of taking a Tarzan Jump! There was a long rope hanging from a tree and a tire attached to it. You had to swing from the platform holding the rope and standing on the tire. Then you could let go of the rope once you were above the water. I did it, it was a first and it was so much fun! I don’t have particularly strong arms so I was quite afraid that I would fall off as soon as I started. I fell off quite soon but at least it was not a vertical fall. That honor went to a young man from Taiwan! So on that high note our rafting at Nakhon Nayok came to an end.